Your life, lived your way—can you see it? Does it feature elements of natural outdoor beauty and opportunities for an active lifestyle? Do you see yourself enjoying first-class amenities, connecting with friends and neighbors in relaxing, resort-style club settings? This is the Woodson’s Reserve vision of what life can be. You’ll find it in our spectacular Woodson’s Club, overlooking a sparkling lake. You’ll find it on our nature trails. You’ll find it in our homes, in the community you’ll enjoy and the friends you and your family will make. Share our vision. Live life your way. Sitting on 4.7 acres of fun, our community amenities feature Woodson's Club, a premier 9,000-square-foot clubhouse including a resort-style pool with a lazy river and island. Plush loungers, shade umbrellas, and entertainment spaces round out the experience. Woodson’s Reserve is dedicated to preserving the environment. 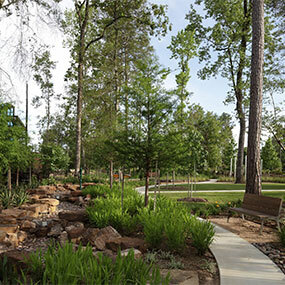 Along our hiking, biking, and walking trails, residents find moments of peace and clarity they can take back to their daily lives, leaving stress and worry miles behind them. Woodson’s Reserve features 115+ acres of preserved nature. Throughout, you will find community parks encouraging outdoor exercise and community interaction, plus beautiful lakes that offer the perfect setting for quiet reflection or family fun. Luxury homes, built to suit the personalities that will make them home—that’s what you’ll find at Woodson’s Reserve. Superior-quality materials, captivating designs, and modern style come together in a myriad of ways, creating efficient-yet-inviting home designs as unique as the individuals who will build their lives there. Call Woodson’s Reserve Home. Live a Life That’s More. Find a new level of relaxation in your home—and access to a modern lifestyle full of opportunities for fun, right outside your front door. Add easy access to the Grand Parkway, and you’ll soon find that this luxurious lifestyle keeps you connected to everything that matters most: The best homes. The finest community. And the entire city, moments away. Who could ask for more? But at Woodson’s Reserve, you always get more. 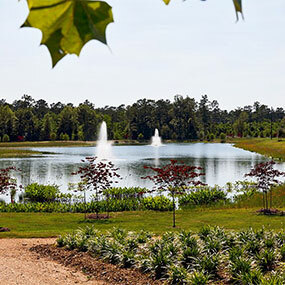 Rather than infringe upon the trees, waterways, and wooded areas surrounding this beautiful site, our designs respect the natural serenity that this community is built on, enhancing them with trails and amenities that make your new home complete. Everything you need to live life well, you’ll find here. Your community revolves around the luxurious differences that set Woodson’s Reserve apart. 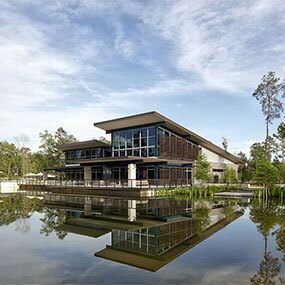 Woodson’s Club offers a resort-style pool and lazy river, a 24-hour fitness room, and a community event lawn. You will enjoy incomparable opportunities to enjoy entertainment, recreation, and connection with your neighbors and friends. Live the good life. Yes, all Woodson’s Reserve homes feature superior quality and design. But what’s more, they offer a feeling—between the style and luxury innovations created by award-winning builders, you’ll find homes built with a feeling in mind; homes built to offer a sense of true belonging for the entire family.